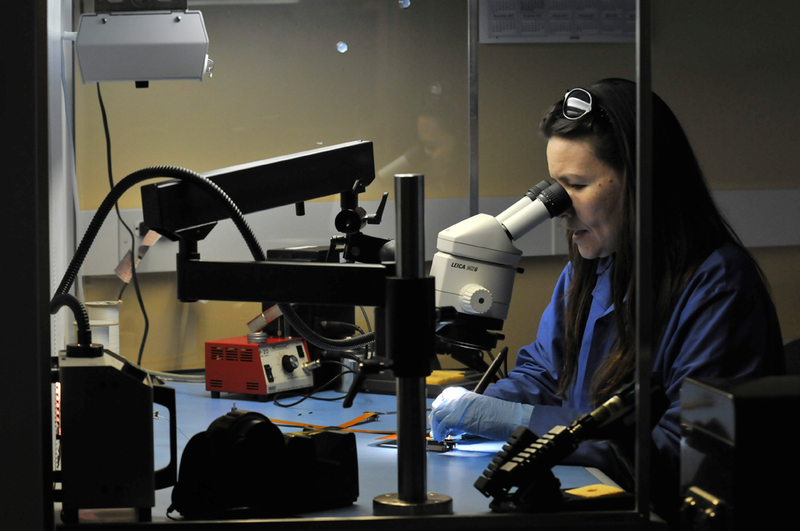 LASP’s production engineers make the theory of a designed component or instrument into a tangible finished product. Frequently one-of-a-kind, our products reflect craftsmanship, expertise, and quality. Mechanical parts that we build in-house begin in the machine shop, where our machinists craft complex parts to design specifications in a wide variety of materials—from aluminum to tantalum. The next step is for our metrology experts to evaluate the parts—both in-house-built and vendor-acquired—to verify that they meet specifications. The cleaning process is next. This important step removes oils from fabrication, fingerprints, and other minute impurities that could damage the finished part; our experts also use bake-out chambers to ensure that materials have properly out-gassed. We finalize our efforts with inspections to make sure that the part meets all necessary standards. Mechanical assembly of the parts into a larger product comes next; we do hand placement of surface-mount parts smaller than a grain of rice to two-inch-square field-programmable gate-arrays (FPGAs) with as many as 352 leads. Staking, bonding, and encapsulating the finished array protects it from the shaking of launch and the extremes of the space environment, providing a backup to reduce strain on the soldering. All of our electrical assemblers and potting experts are qualified to NASA Standard 8739.